Jared Kushner's Criminal Dad Gave Harvard $2.5 Million To Get Him In. How Did Trump Get Into Wharton After Flunking Out Of Fordham? Trump's first choice for college was the University of Southern California, where he wanted to study film-making. He was rejected and wound up going to a much easier school to get into, Fordham. But what people have always wondered is how did Trump get into the University of Pennsylvania's Wharton School of Finance and Commerce in 1966 after he flunked out of Fordham? Trump has often used his Wharton pedigree as a way of defending his ignorance and stupidity. He claimed on Meet The Press that Wharton is "probably the hardest there is to get into... Some of the great business minds in the world have gone to Wharton." One Trump biographer, biographer, Gwenda Blair, wrote in 2001 that Trump was admitted to Wharton as a special favor from a "friendly" admissions officer, a former high school classmate of his older brother, Freddy. For decades there have been vague rumors that money changed hands to get the intellectually lazy and academically anemic Trump into a top school. There were other kids at his school who were far more qualified but who were rejected that year. The admissions officers were dismayed-- and my friend, the tutor, was sickened. I didn't go to an Ivy League school. I was accepted at Cornell but the scholarship they offered-- basically tuition-- wasn't enough for me to afford to go there. I went to a state university instead, but the best one in the New York system, and not academically easy to get into. My roommate was one of the dumbest people I ever ever met-- a nice guy, for sure, but I knew within a week he didn't get into the school based on his high school performance. I didn't care; he paid me to write his papers. The A grades on the papers didn't match up with the rest of his work (F grades, not Ds) and he didn't complete the semester. I asked him how he got in and he told me his mom worked for his hometown's school system and she had altered his records. Wow! Over 50 years later and we have a breaking story in the headlines about how college admissions are still rigged for the rich and well-connected. 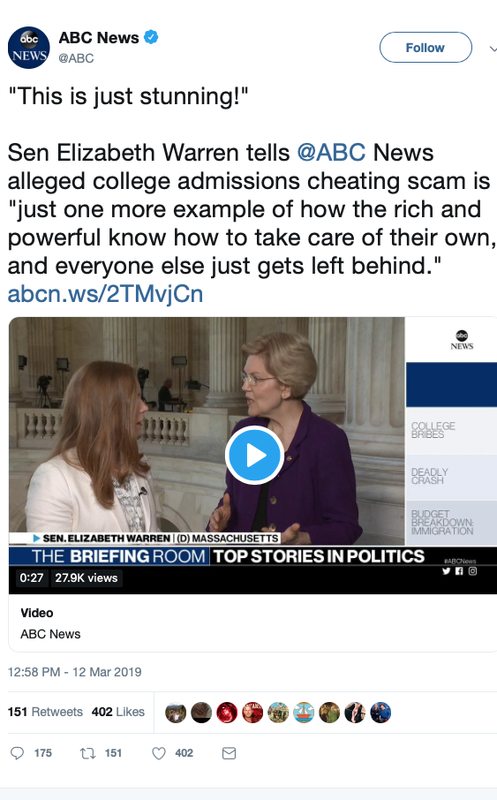 Yesterday Chuck Todd and his crew noted how the scandal is playing into the Democratic nomination battle, although there was no mention of Joe Biden's well known propensity to cheat on tests and steal other people's work. Instead, Team Todd reported on how the current scandal "underscores the divide between the haves and have-nots" and how it "plays into the hands of the Democratic presidential hopefuls who have made erasing this divide a central message in their campaigns," namely Bernie, Elizabeth Warren and Kamala Harris. But the story also might play with Trump voters who think college is rigged, although maybe for a different reason-- affirmative action. The nation is rightfully outraged after yesterday’s news, which exposed 1) how the wealthy have tried to take advantage of the system, and 2) how another American institution (higher education) has let us down. Get ready for the 2020 candidates to seize on it. In fact... Elizabeth Warren: "This is just stunning. I mean, the notion that people thought they could keep cheating like this and build this, evidently build this huge cheating network in order for the children of the rich and the powerful to make it into fancy schools. To me, it’s just one more example of how the rich and powerful know how to take care of their own, and everybody else just gets left behind. I think that’s wrong."